Watts: 40 watt bulb max. Kira is one of the first designs I did in 2005 and it was a challenge to make. I've moved on and do not make Kira anymore. Kira is a contemporary design with an Asian influence and strong architectural features. 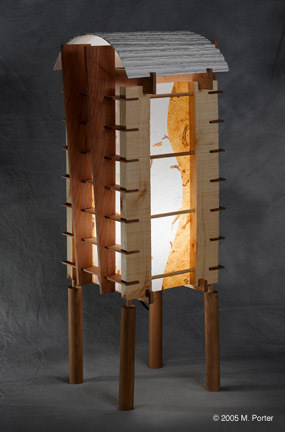 Each lamp is made to order using cherry, pine, brass, and fine textured papers. The lamp uses one 15-watt incandescent bulb (included), 40-watt max. Signed on shade, Kira will be a limited edition. Currently there are two available for purchase. Last I heard there are two of these lamps still out there for sale. One is located at the Columbine Gallery in Colorado, and the other at Kaleidoscope Marketplace in Mt. Horeb, Wisconsin. Check the Where to find section of the web site for address and phone.